Bronzite is an interesting mineral, very similar to Enstatite or Hypersthene. It is often sold tumble polished, carved, or polished. Rough pieces can be found quite easily, too, for the lapidarists amongst us! 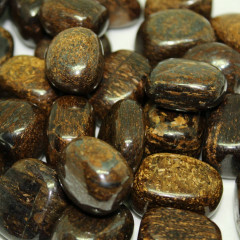 This stone is an interesting mix of green and brown – it is a silicate of Magnesium, and a Iron rich pyroxene. It contains some small inclusions that give it an interesting lustre, and it can look quite similar to bronze sometimes. It is found in several countries around the world, including Germany, Greenland, Brazil, and certain states of the USA. Due to the inclusions, it has a fine optical schiller which can look amazing when the stone is well polished – as such it is generally tumbled, carved into decorative objects, or occasionally carved into cabochons. Due to the Iron content of this stone, it is seen as a protective stone. Some people believe it is good for the skin, and may be beneficial for skin complaints, such as acne, or premature aging, wrinkles, etc.